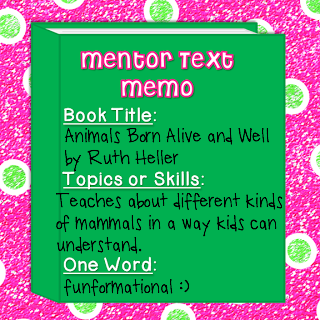 Science Mentor Texts Linky - Hippo Hooray for Second Grade! Saw this super fun linky over at Collaboration Cuties and just had to join in! This was a toss up between another one of Ruth Heller's books, Chickens Aren't the Only Ones. What I love about Ruth Heller's books is that she writes in a way that captivates children. Her writing has a catchy rhythm and rhyme. It is easy for kids to understand, but also uses science terms (like oviparous). My one word is "funformational." Yep, I made that word up :) This book is fun for kids AND informational! Win Win! What are some of your favorite books you use to teach science? Or animal life cycles... since I'm teaching that for the next three weeks :) Head on over and link up! I do not have this book. I will be Chickens Aren't the Only Ones by R. Keller. I will check into it! Thanks. ooops! reading... Chickens Aren't the Only Ones. I'm sorry it's taken me so long to comment!! I read this post on my phone intending to comment at home and then it slipped my mind! Ahhh! 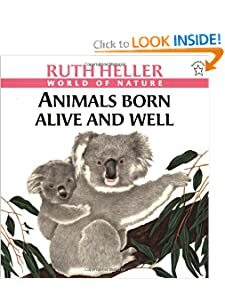 I have not seen Ruth Heller's science books! Yay! A new one for me! Thanks so much! And I love funformational!! Too cute! !